This book systematically details the basic principles and applications of head-related transfer function (HRTF) and virtual auditory display (VAD), and reviews the latest developments in the field, especially those from the author’s own state-of-the-art research group. Head-Related Transfer Function and Virtual Auditory Display covers binaural hearing and the basic principles, experimental measurements, computation, physical characteristics analyses, filter design, and customization of HRTFs. 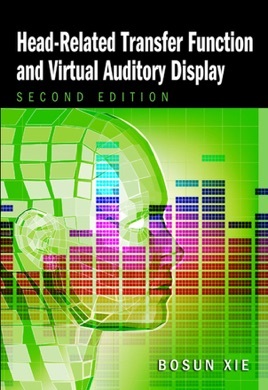 It also details the principles and applications of VADs, including headphone and loudspeaker-based binaural reproduction, virtual reproduction of stereophonic and multi-channel surround sound, binaural room simulation, rendering systems for dynamic and real-time virtual auditory environments, psychoacoustic evaluation and validation of VADs, and a variety of applications of VADs. This guide provides all the necessary knowledge and latest results for researchers, graduate students, and engineers who work in the field of HRTF and VAD.